A cloud strategy is essential for companies migrating to the cloud. While large enterprises still fear two major concerns from cloud computing such as performance and actual experience, small and mid-size enterprises show interests on how they can implement and maximise it in their IT structure. There are three models for cloud adoption: public, private and hybrid cloud solutions; each has its own strengths and limitations. Some companies deploy the public cloud that purely runs across the Internet, while others deploy a private cloud that operates with local storage and servers within the data centre. To some companies that cannot go all the way to either solution, hybrid cloud storage gives them more flexibility and the ability to overcome latency issues. The question is: do you know exactly what to put in the cloud? Whether you’re into public, private or hybrid cloud solution, it is best to review your strategy and assess which workload is important to integrate in the cloud. Once this enterprise workload is integrated in the cloud, it would be easier to communicate in a unified system, enabling all the employees in your company to receive email alerts, view documents at any time and maximise additional features and functionalities of email hosting. In a few taps and touches using mobile devices, productivity and collaboration happen whether inside or outside of the office. 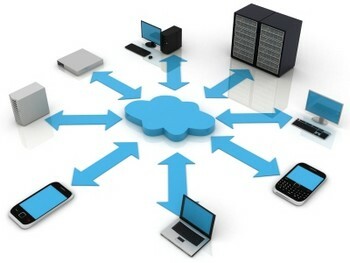 You can use your computer or mobile device to access your hosted web apps in a cloud. Instead of installing the actual software, it allows you to work remotely using smartphone, tablet or laptop while a network of servers does the actual processing. Hosted web apps have servers that can pool all of the processing power in order to handle the requests, and they have specialized servers that can store the data you are working on as well as your employees’ projects. For hosted websites, you can deploy it in various platforms such as Joomla, Drupal, MySQL, WordPress and more. Small and mid-size companies see the cloud as the perfect place to test and develop their apps. Whether you are in the process of building one or to test the latest version, you just have to pay what you need, giving you a virtualized in-house solution during the production and development. Customer relationships are more important than the transactions. While this trend is accelerating, integrating it in the cloud makes it more advantageous to your company. To gain a clear contextually based view of the customers is somewhat challenging, and it requires you to have the latest systems to know the customer nuances and in-depth insights from their perspective. It goes beyond the APIs and cloud integration, and you need a precise and well-planned strategy of cloud model to align all the customer data to your current strategies. A customer-driven cloud integration will reshape your CRM landscape. What do you think? Which of these is right for your cloud? The author works for an online business.